Couldn't find his height anywhere when I checked yesterday. According to futhead, he's only 5'9. They must have that wrong. He's over 6'0 I'd have thought. Playing next to Ekangamene does make you look taller. Best way to tell is to watch the players lining up to shake hands before the game and compare him to a known quantity. It also thinks he's a CAM(outdated...), so I wouldn't take it seriously. He's taller than 5'9" but not as tall as 6'3". Based on the u21s' squad photo I'd say he's just shy of 6'1". Yeah, Thorpe is listed as 6'2, so I'd guess 6'1. Les Kershaw mentioned during Saturday's u18s game that we test how tall every youngster we bring into the academy will eventually end up. Apparently, it's a pretty exact science. When it comes to goalies we test their eventual arm length as well. Can any of you reserve nerds explain how he jumped ahead of Thorpe in the pecking order? I haven't been following the ressies as closely as I used to but had assumed Thorpe would be far more likely to get the nod. Has Paddy been playing much better than him so far this season? I think there's a realtivly simple test that can be made to a child to show their eventual height. Measuring their hands or something?? Can't quite remember. It'd feel a bit freakier if they are analyzing the young players DNA. No. They've both been solid but in my opinion Thorpe edges it. I think prioritizing McNair has to do with potential rather than quality; Louie probably sees McNair as the more likely future first-teamer. Also, Louie did mention being very impressed by McNair's performances in training. That's opinion, not fact. My opinion is that selling our best defender when our defence is in crisis is completely ridiculous. Saying he's very erratic simply isn't true when you look at his performances over the last few years, it's a statement seemingly based on a couple of performances where he clearly isn't match fit. He's not our best defender. People are just too sentimental about Evans. So you're saying his erratic play has been down to a lack of match fitness? Wow! I never saw it affect other players this way. Did you see him against MK Dons? Was that a lack of match fitness too? And even if it is a lack of match fitness, it happens too often because he's always coming back from an injury lay off, so ultimately he's not good enough. Would you keep an employer at your company with similar output? If people are ok with Welbeck leaving because he wasn't the United standard, i.e Rooney and RVP, then they shouldn't be crying over Evans when he similarly fails to meet the United standards set by others like Rio, Vidic, Stam, Bruce, Pallister etc. If he wasn't a home grown player people would be calling for his head. Sentimentality over reality. I hope one of McNair, Blackett, Thorpe or Keane slots in and takes his place. Evans needs to go. Are you making things up again? Sorry, what did I make up the first time? You haven't seen the Vidic comparisons in this thread and in the matchday thread then? Not at all and none whatsoever, it's a judgement call. You say that like Evans is of the level needed! I'd rather put my faith in a fit centre-back who is young rather than one who is 26, has a long history of injuries, cannot be relied upon to stay fit and also makes questionable decisions for a supposed experienced defender. 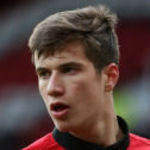 If you count Blackett and McNair, there are currently 6 first team central defenders (regardless of their age) on our books - 3 of them are injured. How many do we need before a couple stay fit? Evans IMO should be sold to make room for the signing of similar age who can bully players, much like Vidic, and who won't get injured every time he goes in for a tackle. @golden_blunder Well yes, of course. I'm not proposing anything different. Its funny that the poster you're replying to suggested that you're letting emotions get in your way of thinking! Evans, 7 consecutive games in 2 years, almost 27, very erratic, always injured, he's our best defender though! The Evans supporters are the ones who are letting emotions and sentimentality get in the way of their thinking. Like you said, i'd rather play one or two of the kids over Evans if they can be counted on to be available when we need them. Evans is just going to block their development. Of course it fecking was, he hadn't played for months. What point are you trying to make there? I'm not getting into another pointless argument about Welbeck, but I don't agree that he wasn't up to it. I'd have kept him but that really has nothing to do with him being an academy player, I just felt judging him purely on his goals record was pointless when his contribution was much greater. I don't think it's a similar situation with Evans at all. I just think he's our best defender and people are typically jumping to knee jerk conclusions based on 2 and a bit games. Your point is that he isn't as good as Rio, Vidic, Stam, Bruce, Pally. Well I agree, but by that token none of our centre halves are. Get rid of Smalling, Jones and Rojo too. And Rafael and Shaw because they aren't as good as Neville or Evra. You then hope he is replaced by some completely unproven youngsters. That's obviously mental. He has injury problems and we need to sort them out, I agree. But so do both Jones and Smalling. They've all shown excellent form in patches, dodgy in others and have struggled without a top defender like Rio or Vidic beside them. At a time when we are struggling to keep defenders fit and no top targets are available, I can't see any scrap of logic in getting rid of one of them and promoting someone who's barely played. To be honest I think many were surprised that he was picked ahead of Thorpe, I suppose it comes down to what the manager saw in training. I've had a quick look on this thread, couldn't find any comparisons. You haven't seen comparisons of his header to Vidic's technique? There's at least three Vidic mentions in this thread alone and a few more in the matchday thread. Anyway, its what it is. Really? You think posters are comparing McNair to Vidic because of a header? As I said, making things up. Was really surprised to see this guys name in the line up. Had never heard of him before hand and thought there were a few other youngesters in the reserves/U21 that were closer to the first team than him. Sounds like he had a good debut, so hopefully he can kick on and turn into a quality player for us. However, I don't know how many times I have to say it but he cannot be relied upon to stay fit. It defeats the object having a seemingly experienced defender who can't play because his injury record is seriously poor and it's not like it's just this season. He's not offering us depth when he's not available for a crucial period of the season and who knows how long it may be before he's available again. This is where it comes down to me, if you want him gone, that's fine but you can't just sell a player and say lets get a replacement. You have to have that replacement lined up. We have seen how common it is to miss out on targets and selling Evans without a guarantee of bringing in a top quality defender is far too much of a risk in my opinion. Don't say well we need to get rid of Evans to make room, that's nonsense. Bring in a better defender than him and make him no longer valuable to the squad and I will agree, find a club for him. Until then, we need him. And I don't want this to sound like I have anything against Blackett and McNair, you won't find anyone happier to see them involved and doing well, it's just we have to calm down at times I think. One thing is clear, the reserves will be excited to see how easily they can get chances under van Gaal. Yeah, makes a difference from last season. Thorpe was doing well in the first half of last season, but had two loan spells to Birmingham cut short by injuries to the same ankle, made only 6 appearances in loan. The season before that he was a near constant in the reserve team, but was often deployed in midfield. I believe this was done to expand his game, as he was a very conservative CM/DM, as well as to give others a chance at CB. Our games went from 3-1 to 1-0 when Thorpe was in midfield, have to say we were much more entertaining with him at CB. However in the first team he could afford to focus primarily on defense and would be unlikely to hamper our offense. McNair was chosen to replace Thorpe and he formed a strong partnership in central defense with Ekangamene (who is no longer with us and used to playing midfield). He's quite good on the air and is calm and composed, though not as strong in the tackle as Thorpe, imo. I thought Thorpe's two years extra experience would have made him the obvious choice, but I suspect McNair was just better in training. FM 14 says he's 173cms 5'8"
Someone else found a site listing him at a similar height. But from the pics I saw online of him next to the 6'2 Thorpe I'd say he's 6'1. He was quite skinny last season, btw, he's filled out a good bit. I'm a fan of Thorpe and I thought he should have gotten a chance last season. So I'm a little biased. My recollection is that the defense in the reserves was very good In the first half with Thorpe, but a bit better with McNair. But I didn't think it was enough to rate McNair over Thorpe, as its a team game. But considering McNair was playing next to Ekangamene, who hadn't played CB previously for the reserves, I was pretty impressed. Can anyone tell me if Ekangamene played any CB for the U18s? Also, I wrote McNair stepped up in the middle of last season, was it actually at the beginning off last season and he just didn't get into the team much until Thorpe left? Hopefully at least one of the academy lads will come good. Was I the only worried seeing this thread bumped thinking that he might have got injured? You should reserve judgement until you see more of him. One game against West Ham is simply not enough. No telling how he would've dealt with the speedy Vardy. Valencia raped him for pace a few times. Indeed reserve judgement, yet judge him. Neither Jones or Smalling looked as if they were in training today so I expect to see McNair again on Sunday. Another big game for him.